In Year 3 children receive the Sacrament of Reconciliation. In preparation for this Sacrament, the children reflect on the fact that they are children of God and that this impacts on the way they treat others. Through studying Bible stories such as Zacchaeus the tax collector and parables like the Prodigal Son, the children learn about Jesus’ teachings on repentance and forgiveness. They learn to appreciate that God created humans with free will thus allowing them to make a decision to make good and bad choices. The children learn to think about the consequences of their actions and how this affects their relationship with God. 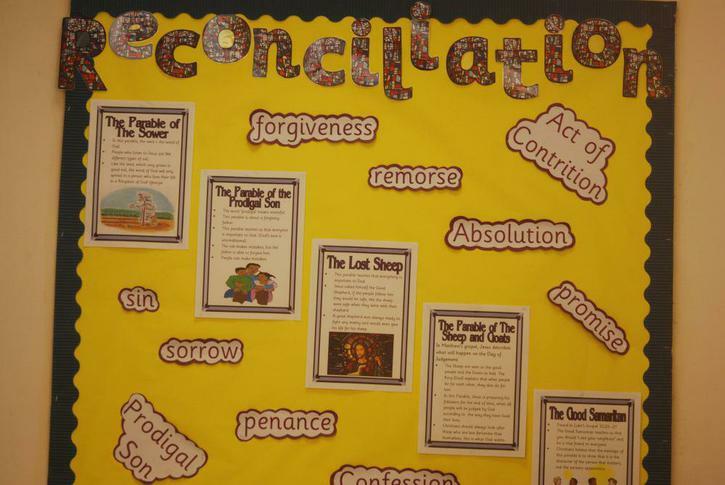 The children learn the structure and sequence of the Rite of Reconciliation and are fully prepared to make their Reconciliation in Lent. And by the help of your grace I will not sin again. Help me to be sorry and to try again.